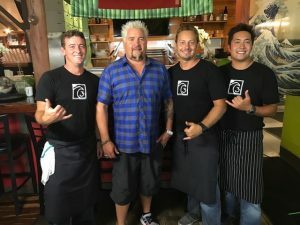 Three’s chefs/co-owners Cody Christopher, Jaron Blosser and Travis Morrin with DDD host Guy Fieri. Courtesy photo. 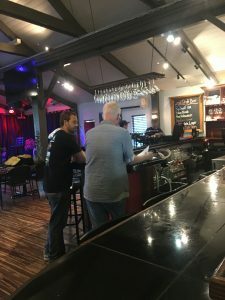 Three’s Bar & Grill in Kīhei will soon be in the national spotlight, featured as a restaurant on the Food Network show, Diners, Drive-ins and Dives (DDD). 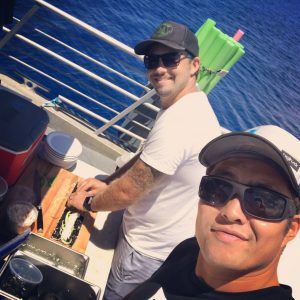 A few days after the shoot, the chefs even got to craft sushi, fish tacos and poke bowls for the DDD team on a private Pacific Whale Foundation catamaran. 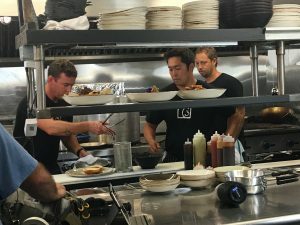 Three’s chef/co-owners in the kitchen for the DDD filming. Courtesy photo. Three’s Asian Beer Can Chicken. Courtesy photo. 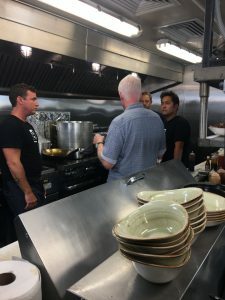 Three’s chef/co-owner Jaron Blosser talks with a DDD producer. Courtesy photo. 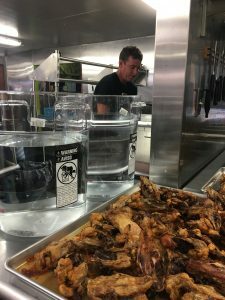 Three’s chef/co-owner Cody Christoper preps behind the scenes of the DDD shoot. Courtesy photo. 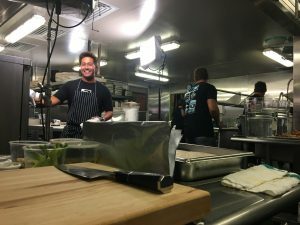 Three’s chef/co-owner Travis Morrin behind the scenes of the Diners, Drive-Ins & Dives shoot. Courtesy photo. Three’s chefs work with the DDD producer. Courtesy photo. 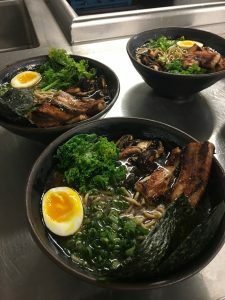 Three’s Traditional Ramen, featured during the DDD shoot. Courtesy photo. 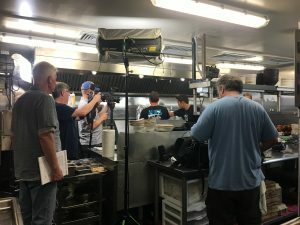 Behind the scenes of the DDD shoot in Three’s kitchen. Courtesy photo. 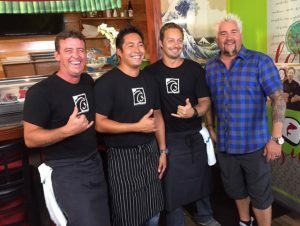 Three’s chefs/co-owners with Diners, Drive-Ins & Dives host Guy Fieri. Courtesy photo. 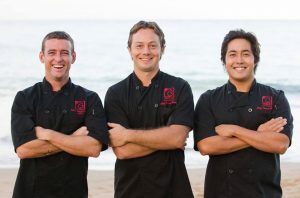 Three’s chefs roll sushi on the ocean for the DDD production crew. Courtesy photo. 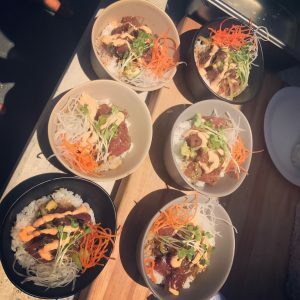 Poke bowls crafted by Three’s chefs for the DDD production crew. Courtesy photo. 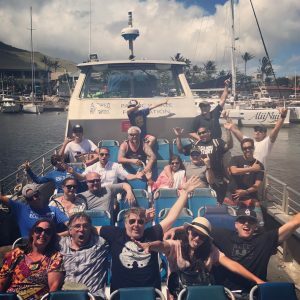 DDD production crew enjoys a day on the water with food from Three’s chefs. Courtesy photo. 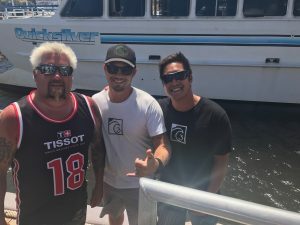 Food Network TV Host Guy Fieri with Three’s chefs Jaron Blosser & Travis Morrin at their boat excursion. Courtesy photo. 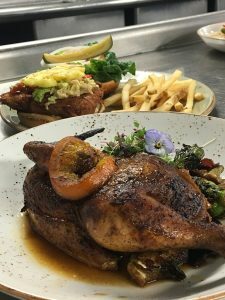 The chefs opened Three’s in Kīhei’s Kalama Village back in 2010, and recently reopened in Fall after a kitchen fire closed the restaurant for 40 days. 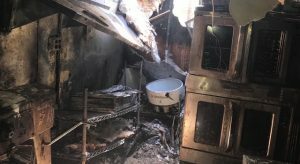 Learn more in Kiaora Bohlool’s video, Three’s Bar & Grill Rises from the Ashes. 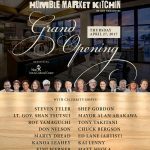 The chefs plan to release a blog on their website soon on their DDD experience, and will let the community know when the Three’s segment will be airing nationally. 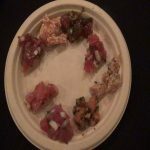 Maui Now has learned Maui Fresh Streatery and Maui Brick Oven are among the other local restaurants being featured on the show.